I was born in the small village Scala situated on the Amalf coast, and ever since music has been a part of my life. My father Giovanni played the trumpet, my mother Anna had a beautiful voice and my ten brothers and sisters were always singing, even though they dedicated their lives to the restaurant business. My father gave me my first guitar when I was 10 years old. I graduated from High School but I never needed a ‘real job’, I could always live from singing and entertaining. I used to sing in weddings and parties, and when I turned 18 I started playing in the night clubs on the Amalfi coast. When I was 20 years old I moved to London and worked as a singer in a fashionable restaurant in the city centre. One year later I travelled around the world working as an entertainer on a cruise ship. So how did I end up in Stockholm – well as so many before me I came for love when I was 25 years old – this was way back in 1973. Sweden is where I made my career starting as a troubadour in the italian restaurants. In 1975 I made my first record with my own songs. 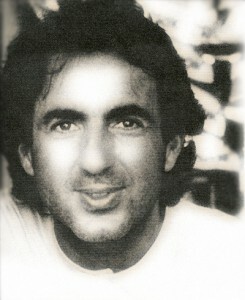 In 1980 my song “È l’amore” was translated to Swedish with the help of Britt Lindeborg – “Vara vänner” (To be friends). It was a great success and reached number one in the Swedish topchart. It was a duet with Cyndee Peters - an American star in Sweden. In 1990 “Mediabolaget”, a Swedish private television company made a film portraying my life called “Sulle ali della musica” (On the wings of music). 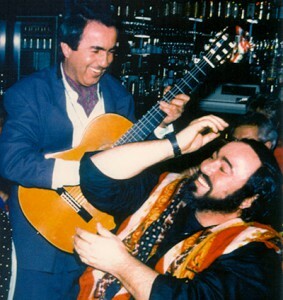 In 1992 I met the great Pavarotti and I sang some of the most beatiful Neapolitan serenades for Luciano – an unforgettable evening. Listen to my version of Pavarotti’s hit Caruso. 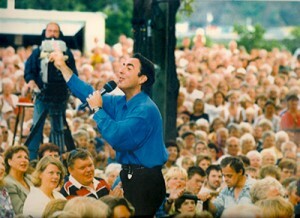 During the years I have participated in all important Swedish TV-shows and in 1995 the Swedish television dedicated a program to me – it was called “Mötet” (The Rendevous). It was filmed in Amalfi with my songs and my family. I have also composed songs for other artists, from Lasse Berghagen, Christer Sjögren, Jahn Teigen etc. My music has taken me all over Sweden, from Ystad to Haparanda. 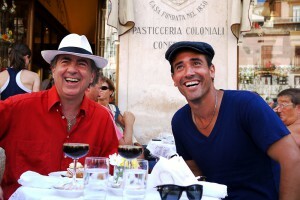 In 2005 I met the Canadian television star David Rocco, he is a model that became a cook and now produces a tv show on the great Italian cuisine “David Rocco’s Dolce Vita”. I have participated in a number of episodes both with my music and as an ‘actor’. The last one was in autumn 2011 and was aired in the summer of 2012 on food channels all over the world. 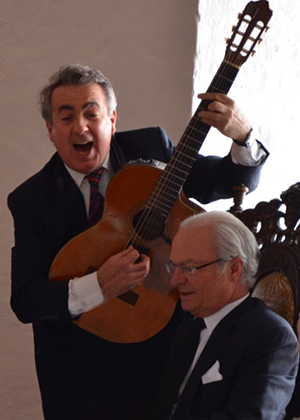 I also have had the pleasure to entertain the Swedish Royal Family several times. I often entertain my older fans who nowadays live in homes providing elderly care. They reward me with a big smile and often say ‘now we don’t need any medicine for 6 months’. I will release my new album “Classico italiano” in spring 2013 with some of the most beautiful italian songs of all times.